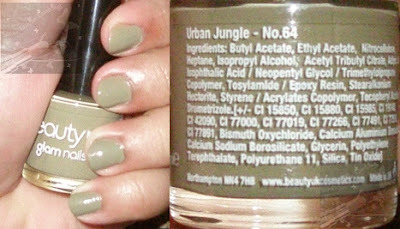 Today I'll be reviewing Beauty UK Glam Nail Polish in Urban Jungle . I have received the goodies in mail couple of weeks ago but I was super busy with my work & family so could not manage to write a review about it . So without wasting a second lets begin the work . Born and bred in the UK (hence the name), beautyuk has grown from strength to strength since its humble beginnings five years ago. We are a family run business, which is quite nice really in a world full of big, scary, faceless corporations, and it means we can provide a much friendlier, more tailored service for our customers. We have big plans to become the number one colour cosmetics brand in the market and we think our website makes our statement quite nicely - we hope you like it. We’re here because we believe make-up should be fun! We’re passionate about fashion, creating quality, affordable cosmetics designed to fire the creative spirit. Our customers aspire to recreate the catwalk look, from the clothes they wear and the way they accessorise, to the make-up they use. Our range of cosmetics provides them with the tools they need to stay on trend in the ever changing fashion world. Through innovation and creative development, we give our customers exciting products that spark their imagination and make enhancing their signature style easy. A beautyuk woman finds and defines her own individuality through fashion. She is confident and loves experimenting with new colours and shades to compliment her look. A beautyuk woman makes her own statement. As spring making it way along with summer & when I opened the package and looked at the color I was so sure Im not going to like the shade at all , its something like which is not of my type and choice . I never go for colors too dull & pale looking as it was visible through glass bottle rather Im a girl who go for pinks , reds, blues and the colors who compliments Spring/Summer so well , and I was so sure about it that Im not going to like the color at all . All of the polishes come in 9 ml bottle with a small brush which I don't like much as it makes application bit troublesome but is OK to work with . I achieved this look after applying 2 coats , 1st application was streaky which I hate . It tend to apply little patchy if you are not careful . 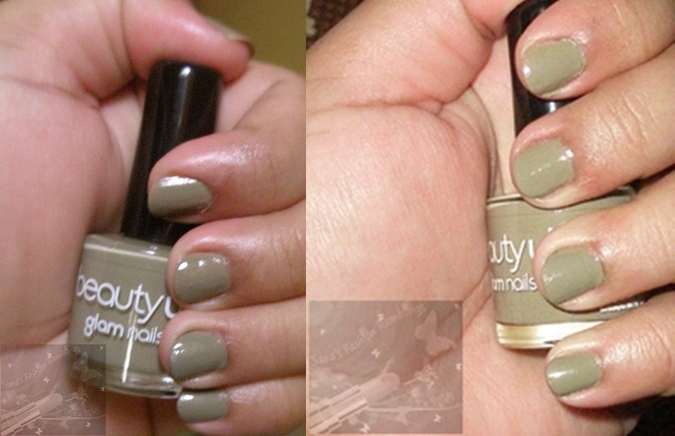 Best is when you apply it with base & top coat . I love its creamy finish after applying & dried out in a min or two . High gloss formula in a handy petite bottle. Make your statement and go glam! Applies streaky with one coat . Start chipping off in 3 days . Small brush is a little mess . What you think about it ? Would you like to try it ? 4 comments on "[NOTD]Beauty UK Glam Nail Polish - Swatches & Review"
I have time I will be back to read a great deal more, Please do keep up the great jo. I'm fairly certain I will be told many new stuff proper right here!